A damaged oil well northwest of Western Australia continued to leak fuel into the Timor Sea in the first week of September 2009. 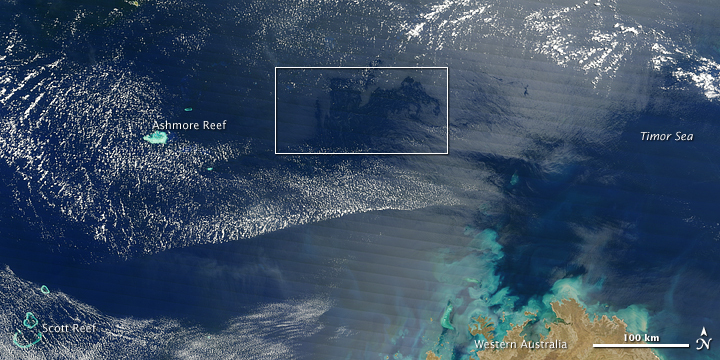 This natural-color image from the Moderate Resolution Imaging Spectroradiometer (MODIS) on NASA’s Terra satellite shows the area affected by the oil slick on September 3. Compared to an image captured on August 30, the area affected appears larger, but that doesn’t automatically mean there is more oil. According to news reports, chemicals that help the oil disperse are being dropped on the slick from airplanes. The light-colored streaks may be some combination of oil and dispersant. 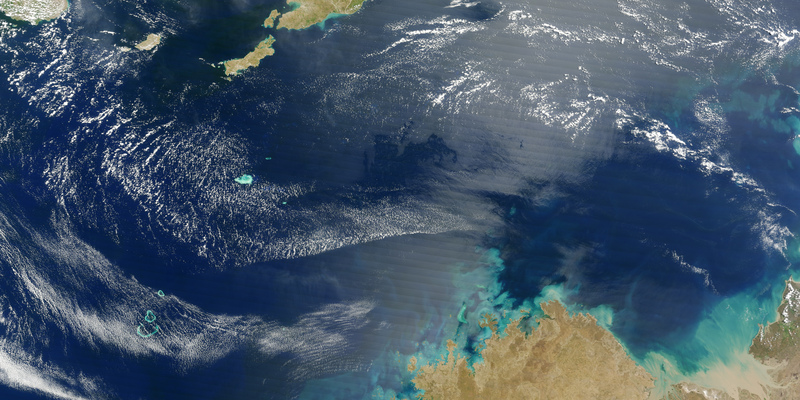 To the southeast, the colorful water is probably a mixture of sediment and phytoplankton. Twice-daily images of the Timor Sea are available from the MODIS Rapid Response Team Website. 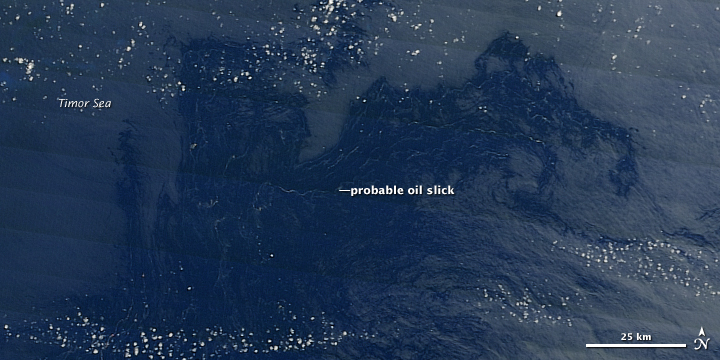 Note that the slick will not be visible in every image; viewing conditions have to be perfect for a thin sheen of oil or droplets to be visible in photo-like satellite imagery. NASA image created by Jesse Allen, using data provided courtesy of the University of Wisconsin’s Space Science and Engineering Center MODIS Direct Broadcast system. Caption by Rebecca Lindsey. An image from September 3, 2009, shows the area affected by a continuing oil spill in the Timor Sea. An oil rig in the Timor Sea began leaking oil and gas on August 21, 2009, and fuel continued to spill into the sea in mid-September.